Here is one proof of concept on how human can interact with SAP applications with natural language! There are several AI/NLP platforms available, but I found the most robust and easiest platform is Google’s API.AI. API.ai is a standalone NLP framework which can be used to natural language-enable any application via APIs as well as to build own chatbots. API.AI makes it possible to receive and respond to user queries in natural language. So, whether you aim to answer questions or help users to be more productive, API.AI can help you build engaging experiences. To build a Conversation Action with API.AI, start by defining the user requests or intents that your service will handle. Then design the conversational flow. If you’re new to API.AI and want to develop Conversation Actions, see handy docs and tutorials. 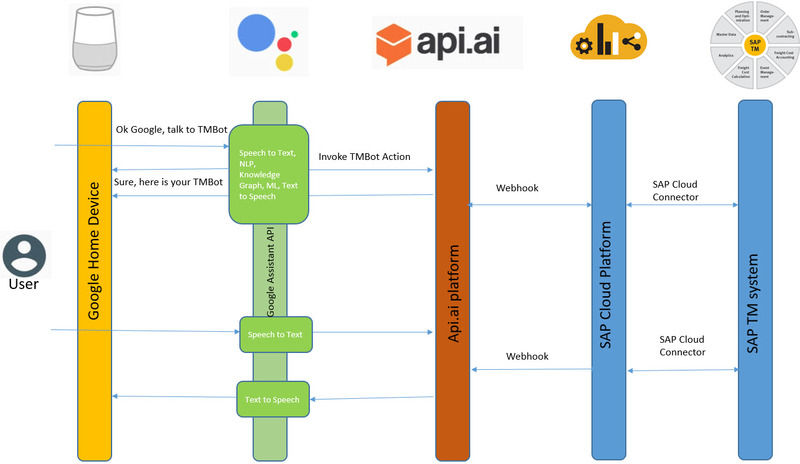 Once your agent is ready in API.AI platform, you can integrate your agent to SAP Cloud Platform via creating a Webhook. Webhook can be any application deployed in SAP Cloud Platform which accept requests in JASON format and respond back in JASON. SAP Cloud Platform provides most powerful capabilities for connecting with SAP backend systems via SAP Cloud Connector. There are thousands of use cases we can think of with this by creating chat-bots and connection different sap application systems. The architecture shown above stays same for any type of bots. SAP Cloud Platform gives powerful ways to interact with an SAP system like never before. With API.AI integration capabilities, you can easily create bots with facebook, skype and connect to the agent you created in api.ai. There is no limit for imagination… so start developing your SAP-Bots now…. Interacting with SAP system with natural language is becoming a very interesting subject. Looking forward to seeing more blogs from you on the subject. Nice Hari… good one. what are your future plans here. Thanks Ananth…. this will be a new UI paradigm in future..lets see.. Awesome blog! It would be best that there is step by step document which we can refer to. Great article. Can you help with concept of webhook in SCP. Awesome ! Great Blog. I have been reading about SAP’s integration capabilities with AI and Bot. I came across your blog while researching for the same for SuccessFactors. I have a use case that I want to use to develop a Bot with Skype or Slack for SuccessFactors. Your blog fueled additional ideas. Thank you ! Thanks Rinky for the feedback. Can you explain the Security Authentication and Authorization behind the Bots being used to access SAP? How do these SAP Bots Authenticate the User is valid before continuing? You don’t want a Bot to go into Payroll and make an adjustment. What are the Authorizations being used in SAP? Authentication shall be done by SAP Cloud Platform and Authorization has to be done by the individual back-end application using regular SAP authorization mechanism. I am trying to build a chatbot using DialogFlow and want to integrate it to SAP i.e. bring data from SAP when some user query is made on DialogFlow tool. Was able to connect to SAP from DialogFlow via SAP cloud Platform i.e. DialogFlow –> SAP CP –> SAP. But my requirement is to connect to SAP directly from DialogFlow. To achieve the same I have created a OData Service and maintained URL for the same Service in Fulfillment section of DialogFlow, but it is giving me error “webhook call failed. error webhook response was empty”. The OData service I have created, in that I have maintained SERVICE TYPE usename/password for same service in SICF. Because of this, I am able to access the OData link directly through internet explorer i.e. it is not asking for username/password. Also using HTTP or HTTPS make any difference? We already have develop own bot server for interaction with sap with inbound text classification and interface with possibility to flexible call any fm inside sap. So we have some benefit now – possible to install locally inside the customers landscape, easy enhance with new function, secured chat with 128 bit encryption and authentication with x.509 certificate ). Hi Could you please provide in detail about how to get particular intent using Actions and how to send that using web hook and how to get the response back from SAP. Could you please let us know the steps in integration from API.AI to SAP and back? Currently, there is not much documentation on this step for beginners like me.